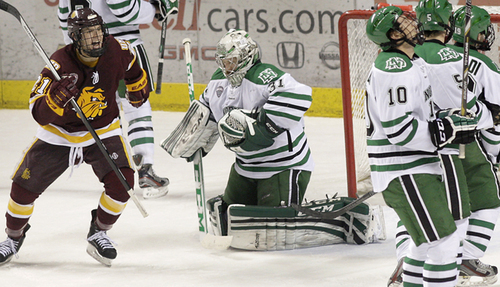 Winning in Grand Forks always seems like a tall-task for UMD. Great UMD teams have struggled there (like the 2003-04 team, which was swept), no UMD lead feels safe (last night, for example) and just when you think UMD has North Dakota in a vulnerable spot, UND finds a way to crush all hope (see last winter’s series at REA). But the hockey gods were kind to the Bulldogs last night. UMD scored six goals — SIX — in the House of Pain and found a way to grab three huge NCHC points. The Bulldogs are now 4-13-4 at the new Ralph and 5-17-3 in Grand Forks during the Sandelin era. And the trend continues — it was a solid Saturday-night win for UMD. The quick start — and especially the Austin Farley power-play goal late in the first period — was huge for the Bulldogs. So was the Sammy Spurrell goal in the final 90 seconds of the middle frame, which came after North Dakota had been generating some quality zone time and scoring chances. Aaron Crandall made a couple huge stops to help the Bulldogs kill the 5-on-3, too, and Adam Krause scored two very underrated goals (instead of trying to put shots off the water bottle, he made NHL-type plays and scored on both).